You can add or edit the file details of documents and images attached to a patient's record. On a patient's Document Manager page, select the check box of a document. The Edit File Details dialog box appears. Title - The name of the document. Tags - The categories or classifications for the document or image. 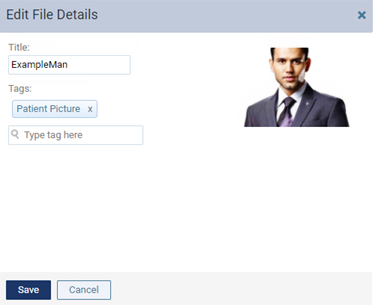 To add a tag, begin typing in the search box, continue typing as needed to narrow the results list, and then either select the desired tag or the '[text]' (Create) option (where [text] represents the text that you have typed) to add a new tag (which can be used to tag any other patient's uploads, too). Repeat this process as needed to add other tags to the document or image. To remove a tag from the document or image, click (or tap) the X next to that tag. In the document manager, you can view documents and images by tags. Each document or image can have up to five tags. It would be great to Tag a document to a tooth, teeth, quadrant, procedure. Especially a letter to or from a specialist or referral. And to link it to that tooth, teeth, quadrant, or procedure in the Pt Chart. So that the document could be accessed by a click-able link right from the Chart. I have updated your request in the "Feature Request" forum. Could you please supply a list of default tags that you have already set up?